Few things get twenty and thirty-somethings more fired up about their youth than sports and fashion. This affinity explains the recent spike in interest in the throwback jersey and shoe, and nowhere is that more clear than in the realm of basketball. It seems as though many sneaker aficionados are more interested in reissues from their childhood than in new styles. Below are a few examples of what made basketball sneakers from “back then” so damn cool. An instantly recognizable shoe, these kicks were pimped out hard by Reebok starting in 1989 or so. But Reebok really went all-out during the 1992 Barcelona Olympics and after signing Shaq to a huge endorsement contract immediately out of college. The shoes also got great exposure from Dee Brown’s “no-look” slam dunk contest victory in 1991, when he took his sweet time pumping up his Reebok Omni-Lites in front of the cameras. 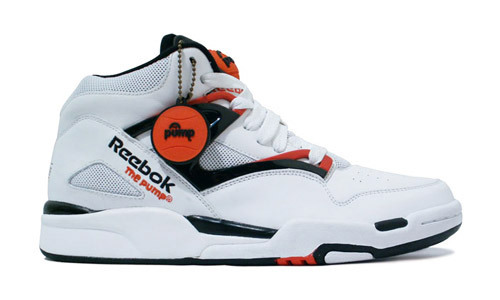 Unfortunately, the Reebok Pump didn’t seem to actually enhance one’s performance, so after the novelty wore off, the shoes went from unpopular to out of production. 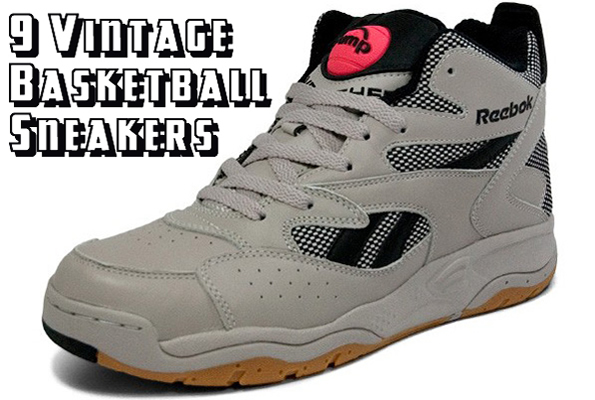 But the Pumps have ridden a wave of nostalgia recently and have been reissued by Reebok in both their classic designs and new colorways of older styles. Though it seemed to fade from public consciousness as soon as it entered it, Converse’s The Weapon was THE shoe to have in the NBA. Released in 1985, it was worn by both Magic Johnson and Larry Bird for several years in the late 80’s, ensuring that the shoe would get no shortage of airtime. While the shoe isn’t exactly stunning, it was a very popular among basketball players because it came in a wide variety of colorways, encouraging whole teams to adopt the shoe as part of their uniform. 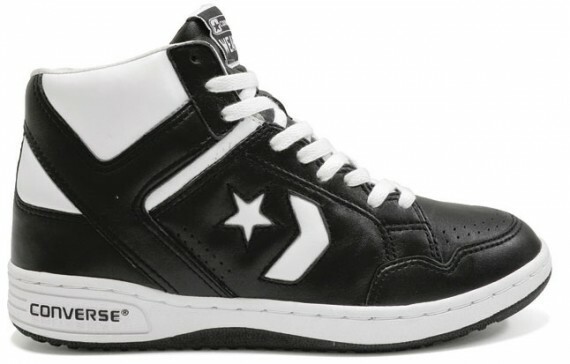 Converse is now more or less relegated to the world of hipster-dom, but let this entry document the fact that once upon a time they made some pretty badass basketball shoes. While it was dormant for a few years in the 90’s, it’s still safe to say that Nike’s Air Force 1’s have been the most popular basketball shoe in the world since their release in 1982. Just ask Nelly. Since its introduction, the shoe has been released in over 1700 colorways, generating Nike revenue of $800 million per year. Not bad for a 29 year-old product. The key to the AF1’s success has been both its classic, timeless design, and Nike’s willingness to let almost anyone customize this shoe, allowing for a wide variety of shoes that appeal to everyone (from the hip-hop community to skateboarders to athletes). While they aren’t seen much on the court anymore, these shoes have the distinction of being one of the first pairs of basketball shoes that any company ever paid players to wear (Puma was the first with its “Clyde” shoe in the 1970’s). It’s almost ridiculous to think of the NBA without shoe endorsements, but these guys were the first to pull the trigger on it in a widespread fashion. There will never be a consensus on which Air Jordan best defines the brand. I can’t even make up my own mind, so let’s discuss the early releases from the line. To this day, Nike and Michael Jordan have probably had the most symbiotic relationship of any corporation and its endorser, and the Air Jordan brand has become synonymous with the “basketball shoe”. Jordans were THE shoe to own during the late 80’s, so much so that people were shooting each other and stealing these shoes in 1988 and 1989. Apparently, this crime was so prevalent that many public schools in urban areas were prohibiting students from wearing them. Shoes so cool that they will get you killed? Yeah, the Jordans make the list. It’s pretty safe to say that these are vintage basketball sneakers, having been made specifically for the game back in 1917. Given the materials and construction, these shoes really do look like the first basketball shoes ever made in much the same way that the Model T Ford looks like one of the first cars ever made. There aren’t many frills on this shoes. It’s got a canvas top, no-slip rubber sole, and…ummm…laces. 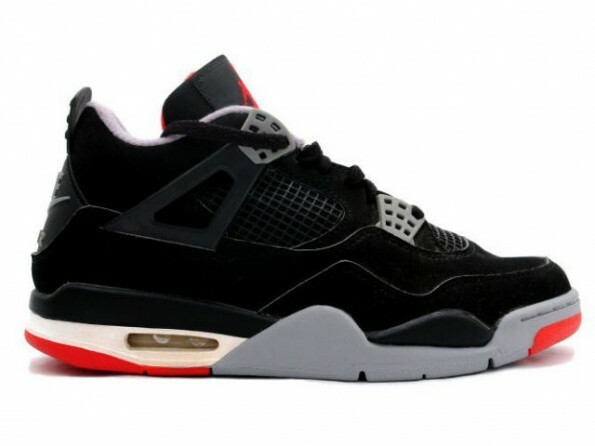 They were originally released in white (which was more like an unbleached beige) and black. However, like the Air Force One and Converse Weapons, the minds at converse realized that even back in the 20’s, 30’s and 40’s, players and teams wanted a variety of colors that would match their uniforms, so Chucks lent themselves to virtually every color in the spectrum at one time or another. While the recent resurgence of Chucks is impressive, what is more impressive is the fact that this shoe was THE basketball shoe for over thirty years. In today’s market, a shoe is a raging success if it can last and remain relevant for an entire season. 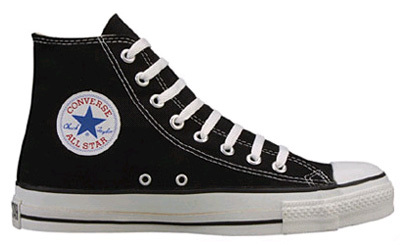 While Converse may not be the athletic shoe manufacturer it once was, the fact that their one model, the Chuck Taylor’s, have thrived for just under a century is a testament to how long a good idea can last. 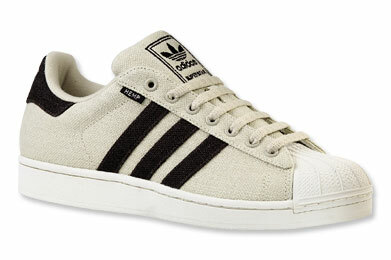 Introduced in 1969, today the Adidas Superstar looks like a shattered ankle waiting to happen. But it was the most popular shoe in the NBA for most of the 70’s, with 75% of the league wearing them. This is probably due to the fact that one of the first adopters of the Superstar was the legendary Kareem Abdul-Jabbar. 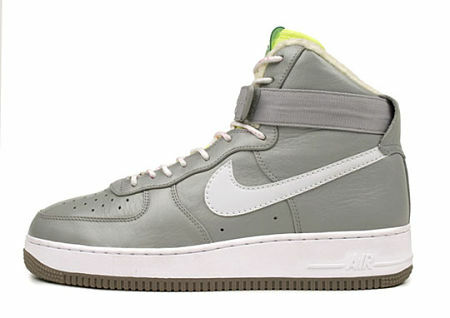 Perhaps most interesting about this shoe is the fact that it was modeled after a high-top that didn’t sell well. 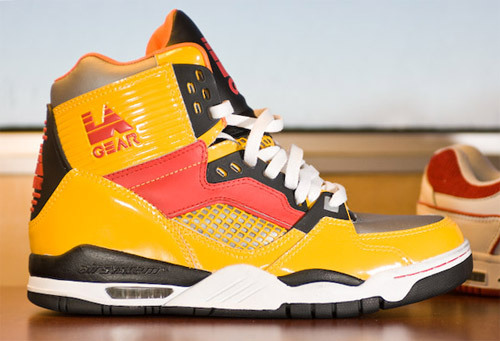 It wasn’t until the low-top version came out that it gained traction with both NBA and NCAA players. However, what sealed the fate of the Superstars didn’t occur until the 80’s, when a NYC rap group called Run-DMC decided to make them a staple of their look and even memorialize them in a song called, appropriately enough, “My Adidas”. Beyond that, the list of those that have been wearing “shell toes” recently include Lady Sovereign, Jay-Z, Moby, Good Charlotte, Missy Elliott, the Black-Eyed Peas, Korn, Craig David, Bow Wow, and Chris Martin of Coldplay. Like the Chuck Taylor’s, even though the Superstar’s day on the court has come and gone, it’s found a renewed life in popular fashion. 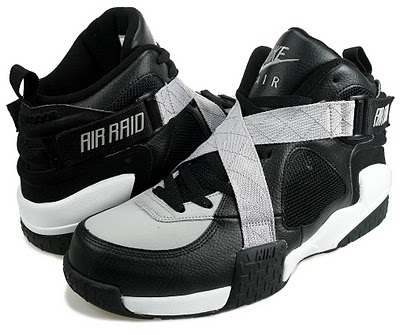 Released in 1993, the Air Raid embodied the culture of “White Men Can’t Jump” and playground basketball rather than the sleek play on the courts of the NBA. The shoe’s hallmark was its indestructibility, not its performance features. In a nod to the posturing and trash-talking that takes place during outdoor basketball, this shoe was created by esteemed Nike designer Tinker Hatfield to look as intimidating as possible. Because of the crossing gray straps that went over the laces, this shoe was often associated (coincidentally) with Malcolm X, which positioned the shoe to an entirely new demographic through that association. The release of this shoe was part of Reebok’s Blacktop line, which also featured shoes built from durable materials, often in all black to disguise wear from playing on concrete or tarmac. In 1993, Nike introduced the newest iteration of its Air Max line. Both the running and basketball shoes featured an oversized pocket of air to provide extra cushioning. Though this feature was an extension of its Air 180 line, the new Air Max series proved to be wildly popular. 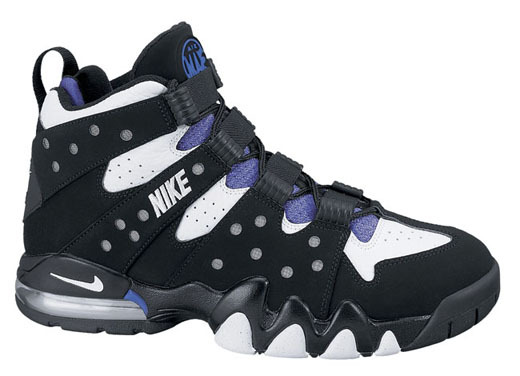 A natural spokesperson for Nike’s newest extra-cushioned shoes was Charles Barkley, whose stocky physique and powerful play spoke well to the shoe’s design. Nike may have taken it a little far when they introduced an ad campaign of Barkley fighting an animated Godzilla, but the point was made. These were shoes for powerful basketball players, and it didn’t hurt that they looked quite sharp as well. In our desire to end on the weakest note possible to show readers that nostalgia isn’t always a good thing, we present the LA Lights, a shoe that not only featured eyelets that would accommodate three different color laces to get that, um, “colorful” look, but also featured technology that lit the heel every time you took a step in these monstrosities. While they certainly seemed to be designed for spastic 8 year-olds, these shoes somehow became the footwear of choice for the type of people that wore jean shorts and frequented amusement parks. The purpose of the flashing lights on the heel was unknown, as they were almost immediately banned by the NBA and any other sort of athletic association for simply being awful and obnoxious. However, for one short summer in 1992, one couldn’t walk through an urban landscape without being subjected to lots of little flashing LED lights. Thank God the shoes were cheaply made and the lights burned out after about a month.